The photograph is barely two weeks old but already it feels like it has existed forever. On 1 February superstar singer Beyonce announced on Instagram that she is pregnant with twins - with 10.2 million "likes" (and counting) the photograph has become the most popular picture ever on the social media platform. For days people around the world chatted about the complex symbolism behind the picture, its possible similarity to awkward posed family photographs, and some even thanked Beyonce for crushing the myth that women must wear matching underwear. 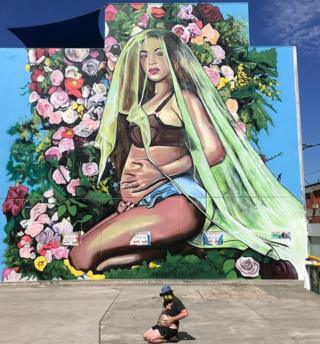 Now a 20-metre (60ft) high mural of Queen Bey in her flowing green veil and purple bra with blue pants has appeared in the trendy Collingwood district in Melbourne, Australia. The artist is Mark Walls, known as Lushsux on social media. He has made a name for himself by painting celebrities and politicians, including Kim Kardashian, Hillary Clinton and "Salt Bae" - the Turkish man whose videos of cutting meat made him a social media sensation in January. Image caption Mark Walls also painted Turkish social media sensation "Salt Bae"
Mark Walls says he chose Beyonce to be his most recent muse because her photograph broke world records and he likes to "paint things that normal people like". "Street art used to be about real counter-culture - but now that has been normalised. What used to be radical is now just mainstream and not cool. "Beyonce is really the antithesis to what normal street art people like," Walls explains. But although he recognises the power of the photograph, he isn't exactly Beyonce's number one fan. "She's not bad or anything. She is talented - wasn't she in TLC before?" he commented. When it was pointed out that before she went solo, Beyonce actually used to sing in Destiny's Child not TLC, Wells replied that he really likes Destiny's Child too. The mural is already proving popular. Pregnant women have posted pictures of themselves posing in front of it, including Amy Jackett who is 40 weeks pregnant. Not everyone is happy though. One local resident complained that it is a "horrendous eyesore" that he hoped was defaced as soon as possible. But painting walls is not just a frivolous hobby for Wells, who used to work in a soft drinks factory. The paint for the Beyonce mural cost him A$8,000 (£4,850), and it took him five days of standing outside in the blazing summer heat. He says it's worth it. "Whether people like it or hate it, they take photographs and discuss it. "I enjoy laughing at some of the angry reactions". Walls claims that he gets unique commissions as a result of the global attention, including one from the Russian Foreign Ministry. In January he tweeted a photograph of his mural of the popular meme of a fake photograph of Russian President Vladimir Putin riding a bear. Political street art is popular in Russia, and the president is already the subject of numerous murals. "The next thing I knew after sending the tweet was a guy claiming to be in the Russian foreign ministry contacted me to ask if I would come to Russia to paint Putin. "I want to do it - I'm now trying to make it happen", Walls explains. Is he worried about what might happen if the mural does not meet the brief? He says he just hopes he won't meet a sticky end.